We are able to construct prefabricated steel buildings in single and double floors, and economical constructions with large spaces that are being applied in all developed countries. After the disaster of earthquake that happened to us we understood the importance of prefabricated buildings and houses, which we have named as environment friendly homes, and started to build in the quality to meet all kinds of needs. We build office living containers, jobsite buildings, or living containers, which are formed for the purpose of meeting human needs and livings during summer and winter, for emergency sheltering after earthquakes, produced mostly of bent steel with insulation, including WC, shower, with kitchen for preparing tea, made of steel and other metals, and in different dimensions and sizes in single and double floors. When producing Karmod modular polyester (FSP) cabins, the product of outstanding technology, which are designed by our Turkish engineers and architects, polyurethane is injected between double wall material, thus sandwich panels are formed and modular cabins are produced by joining such panels, the offered to users for different purposes as modern, economical and practical solutions. They are heat insulated. Karmod portable polyester and polyethylene toilet (WC), shower units are special products aiming especially developed for professional users common using areas such as commercial, construction sites, organizations and social facilities. Two important advantages of the product are being mobile and portable units. Our company, which produces water cisterns and storages as polyester (fiber) tanks in a range of 100 liters up to 50,000 liters, has taken its place in domestic and international markets. Our firm has ISO 9001-2000 and TSEK Quality Certificates and exports them to 43 countries. Polyethylene water cisterns, acid tanks and chemical storages that are used to store and transport water and various chemicals, which are produced in different volumes between 20 litres up to 25.000 liters, are durable and long lasting. Outlet connections of polyethylene stores that are used when preparing foodstuff, keeping and storing water and chemicals are made of brass. A boat is the essential part, which sits on water surface, consisting of the frame, keel and fiber coating. When one says boat it means sea vehicle with oar or motor. Most of boats are produced in our nowadays from fiber. Very strong and durable boats are produced by fiberglass (polyester) technology. Fiber boats are easier to maintain than wooden boats. 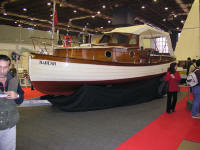 Wooden boats need painting, varnishing and maintenance every year. When you paint parts of your boat under waterline with toxic paints, if it does not have any blow does not need any maintenance for a long time. Even if your boat has any blow and breaks it is possible to repair. Kartal Plast Polyester Products & Construction Ind. Trade Ltd.